Tammuz, 1942, German army battalions headed by General Rommel were positioned in Egypt and making their final preparations to invade the Land of Israel in several days. A feeling of despair was in the streets. People walked around like shadows filled with pessimism and gloom as the rumors of the millions of Jews murdered in the gas chambers in Europe began to arrive in Israel along with the knowledge that there was no way to stop the Nazi Satan from bringing into reality its plans to destroy the entire Jewish community of the land of Israel as well. The holy Kabbalist Rabbi Yehudia Fatiya zts”l announced to his students and family members that in his opinion the most auspicious place to awaken the mercy of Heaven and to stop this evil decree was Rachel’s Tomb, which had been a place of wonders for generations and generations. 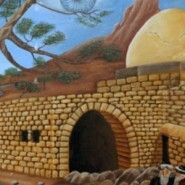 Rabbi Fatiya announced to them that he was planning to spend 24 hours fasting at Rachel’s Tomb. At that time Rachel’s Tomb was a desolate place where it wasn’t possible to spend long stretches of time….So they asked the mythological watchman of Rachel’s Tomb, Rabbi Shlomo Freiman zts”l, and he prepared the place to accommodate those who would be coming to pray. At sunrise about 100 men set out from Jerusalem to pray at Rachel’s Tomb, along with a few women from the rabbi’s family. The people who came to pray wore sackcloth and placed ashes on their heads and prayed from that morning until the following morning. They opened the gates of Heaven with their screams in order to awaken the merit of Rachel Imenu that she should make a request for her children and save what was left of the Jewish people. The whole night the screams of prayer and shofar blasts shook the quiet of the night around Bethlehem where the residents slept soundly. Not far from the tent of Rachel Imenu there was a wealthy Christian’s large palace. The British government used this palace as a residence for its administrators , and the British brought wealthy people and diplomats there from other countries including an Italian family from Egypt. That same night on account of the screams and shofar blasts that shook worlds, the residents of the palace could not sleep. Some of them came in the morning and asked, “What’s going on here?” and the Jews answered them that this was a holy place. “Why was there that huge noise last night?” they then asked. Rabbi Yehuda sat outside and heard the conversation between the Jew and the Italian, immediately instructed all of his people to come back inside, and he commanded them to pray with tears, and to collect their tears inside cups they were holding. Rabbi Yehuda filled a cup with the tears he had cried as he’d prayed, and at 2 PM he drank his cup of tears. Suddenly Rabbi Yehuda spread out his arms to the sides and fainted as he fell forward. Rabbi Asher Zevaida recalls that when they lifted him up, the rabbi asked those present, “You didn’t see? You didn’t hear?” And they all responded with confusion and didn’t understand what he was referring to. Afterwards they prayed Mincha, and Rabbi Yehuda Fatiya zts”l instructed them to set a table fit for a king for a meal of thanksgiving, and they sang and danced with praise to God. That evening they returned to Jerusalem and the city was rejoicing on account of the rumours that at 2 PM the Germans led by Rommel changed their plans for no logical reason. Wow amazing story! Thank you for publicizing this! !